Spring has finally sprung, but for some of us it isn’t quite short and sandals weather. If you’re like me, all of those Instagram photos of babes in dresses and shorts have you craving warmer temps, wanting to shed some layers, and even show a little bit of skin! If Old Man Winter is saying, “not so fast!” that’s ok! The trend I’m sharing with you in today’s post is perfect to wear when the temperatures haven’t quite caught up with the season change (take that, Mr. Winter)! Off the shoulder tops are the perfect piece to kick off your spring wardrobe and the best part is that they’re ultra flattering! I love this BB Dakota OTS top because it’s lightweight and the elastic in the top stretches enough so it doesn’t easily come up and off of the shoulder. It’s also a great length and can be tucked! OTS tops are also darling with skirts in the summer! 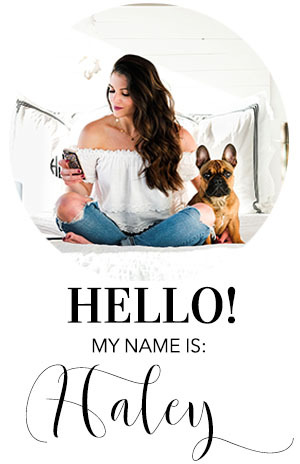 Check out this post where I paired a suede mini with an off the shoulder top (and OMG Dwayne was the CUTEST PUPPY EVER)! Another fun way to wear an OTS top while you’re waiting for warm weather is to pair one with 70’s inspired flares! SHOP MORE OTS TOPS UNDER $100! If you want even more fabulous ways to style off the shoulder tops, check out my Spring Style Pinterest Board! Cheers, friends!